I’ll be watching the telecast from Durban on Saturday – of course I will you can’t break the habit of a lifetime. But I find the whole bonanza of a modern Lions tour grotesquely overblown and rather vulgar. I reckon that I was at the very last Lions international that really mattered – at Ellis Park back in 1997. In those days the Lions were still called the “British Lions” of course – the correct colloquialism for what was, and always had been, the “British Isles” rugby team. And in those days rugby was still (mostly) an amateur sport. The excitement came from the fact that top class rugby would be played by two teams most of whose players played only for the love of the game. And the team had still its traditional name without anybody, least of all the Irish players, really caring that some ignoramus might think that the “British” in the “British Lions” referred to a country rather than to geography. But now so as not to upset a few dim-witted Irish nationalists we have to use the ghastly solecism “British and Irish Lions”. What nonsense. The Lions famously won that tour in 1997, but they haven’t won since (one lone Test in Australia aside) and the last tour to New Zealand was an embarrassment. But whilst the tours have become more and more one-sided the hype and the commercialisation has escalated. The replica Lions shirt in the RFU shop costs £99.99 - a mark-up, I suspect, of perhaps £95 over the production costs. And the advertisement from Thomas Cook offered tours starting from £1999 to see one "Test" and £2499 to see two. And that pretty much sums up the rationale for this year's commercial bonanza in South Africa. 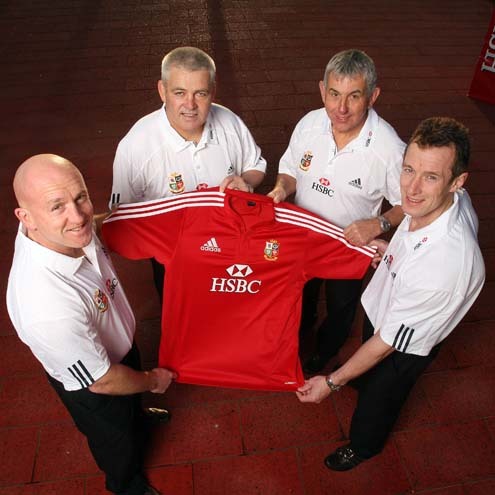 The Lions in 2005 were not humiliated by the All Blacks because of the deficiencies of Alastair Campbell nor by the mistakes of Clive Woodward. They were beaten because a southern hemisphere side will never again be beaten by a rag, tag and bobtail assemblage of British Isles players, however individually talented these players may be. The South Africans are full time professionals both individually and as a unit. The hastily assembled Lions cannot possibly be expected to gel together as efficiently and skilfully as the Springboks – they will be lucky to avoid defeat by less than twenty points in any of their matches against the Boks. In the days of amateur international rugby there was a logic and, yes, a romance about the Lions that led to some heroic achievements. But in the professional era a side which plays together continuously for a year or more, as the South Africans will have done, will have a huge edge over a mishmash of players who cannot possibly be as familiar with one another as their opponents will be. The only justification for the continued existence of the Lions is the commercial bonanza that a Lions tour creates. For me that is insufficient reason for the tour to go ahead - and certainly there is no case at all for international caps to continue to be awarded for these one-sided and irrelevant matches. John Shepherd was a leading allrounder in first-class cricket in England in the 1970s and 1980s. He was a loyal servant of Kent for seventeen seasons and of Gloucestershire, as player and coach, for seven more. 'Shep' was born in Barbados where his natural talent was spotted and nurtured by Everton Weekes, one of the 'three Ws'. He was brought to England by Kent in 1965 and his successful adaptation to county cricket led to awards as the leading allrounder in English cricket in 1968, Wisden Cricketer of the Year in 1979, and to recognition in five Tests for the West Indies. Paddy Briggs brings a journalist's eye to Shep's early years in the Caribbean, his brief Test career, his controversial involvement in tours to Southern Africa in the apartheid era, his clumsy sacking by Kent in 1981 and his late‑flowering achievements with Gloucestershire in the 1980s. In a thoughtful and challenging “Introduction” Paddy also unravels some of the complex influences on cricket in Shep’s years in the game and draws some telling contrasts with cricket today. Throughout his career Shep was the most loyal of players and colleagues: his gloriously cavalier batting made him a special favourite with fans. His loyalty and effort are well‑described in a candid telling of his story. The book was successfully launched on a gloriously sunny day at Tunbridge Wells this week. The popular Shep drew a long line of well-wishers (and book buyers!) to the marquee of the Kent Supporters Club. The modest celebrations of the MCC member who took a fine catch in the Pavilion at Lord's on 9th June 2009. Your correspondent is extreme left standing to applaud (and relieved that the ball didn't come to him)! The orange Dutch hats were thrown high in the air last night to cap a famous and fully deserved victory for the team from The Netherlands against hosts England in the opening match in this year’s ICC World Twenty20. We were denied the pleasures of hearing and seeing Alesha Dixon perform as the opening ceremony was cancelled for “Health and Safety” reasons (quite what these reasons were we weren’t told). For a moment I did wonder if a hastily arranged song from a new “Three Tenors” group had been substituted, but no - it was only ICC President David Morgan, ECB Supremo Giles Clarke and the Duke of Kent who were on the makeshift días in front of the Pavilion. Morgan and The Duke made speeches of predictable banality (we were spared Clarke) – and then, at last, the stage was set for the real business of the day. That we saw play at all we must thank the MCC who have installed permanent floodlights at the home of cricket that not only look elegant but work superbly -they weren’t supposed to be used yesterday but the skies were leaden and without them I suspect we wouldn’t have had a full match. Similarly the modern Lord’s drainage system is so good that within minutes of the rain ceasing the ground was fit for play – a stark contrast with Headingley a couple of weeks ago. At the end of the eleventh over England was 100-0 with Bopara and Wright coasting along nicely. A score of approaching 200 seemed in prospect but the Dutch were not wilting and stuck to their task to good effect. The final nine overs delivered only 62 runs with just four boundaries - and there was not one six in the whole innings. Shah, Morgan and Collingwood were out to particularly inept shots and with all due respect to his talents Rob Key was not the figure you might hope to see coming to the wicket when you are 144-4 with 22 balls to go. He duly failed to hit a boundary off any of the eight balls he received. Note for Morgan: if you are going to decide before the ball is bowled that you will play a reverse sweep do check that there isn’t a fielder standing in the way! Surely given the good start a team of (mostly) experienced professional cricketers should have been able to put the game out of reach of a Dutch side many of whom play only for the love of the game. The killer instinct was missing, as was the injured Kevin Pietersen, and England’s total was respectable when it should have been unreachable. That the Dutch won was mostly, I think, attributable to their greater will-to-win and self belief. The batted with enterprise and skill attacking the bad balls and hitting four towering sixes in their innings (one of which might have woken up a few people in the MCC President’s box). By the time it dawned on England that they really good lose the match it was almost too late – the Dutch paced their chase wonderfully well. In the end there was a nail-biting final over and there could have been any one of three results off the final ball. But the Dutch deserved their win and England added a new item to their list of disappointments in international limited overs cricket by losing to a “minnow” for the first time. The Dutch have an expression “Goed is wel, maar beter wint” which in a sporting context roughly means “It’s alright to play well, but you need to play better than that to win” – a lesson England could certainly learn. It may be rather fanciful to describe last night’s Twenty20 match at Hove as a metaphor for anything but at the end of the farcical proceedings I couldn’t help feeling that there was something utterly English, and particularly something which typified the state of English cricket, about the proceedings. For those who missed it the match was between Sussex and Kent and it took place on the home county’s rather ugly little ground at Hove. The ground appeared to be perhaps half full – maybe a little more – a disappointing crowd for what should have been a money-spinner between local rivals. It was a day/night match starting at a time which would allow spectators to come from work and it was also televised live by Sky. It was pretty lacklustre stuff from the start with only a small amount of excitement generated in Sussex’s uninspiring innings of 131-3 with only thirteen boundaries. The star performer was the West Indian Dwayne Smith who scored a decent 69 not out off 59 balls but the Kent bowling looked far from threatening and Sussex really should have scored more and taken more chances with plenty of wickets in hand. 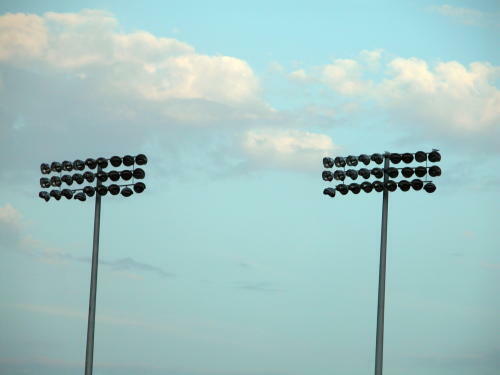 As the dull Sussex innings proceeded it became clear that there was a problem with the lights – only two of the four floodlight masts appeared to be working. The culpability of the Sussex County Club was clear, although they will no doubt pass the blame to others. But the facts speak for themselves – they failed to provide proper floodlighting for a high-ish profile and televised day/night match! But whilst Sussex’s administrators should this morning be wriggling with guilt those in charge of the cricket proceedings on the day, on and off the filed, should feel embarrassed as well. No decision was made about an agreed limit to Kent’s innings (it was clear that they would not get 20 overs in). So the Kent batsmen knew only that if they batted for five overs there would be a match but that how long the match would last was, literally, in the lap of the Gods – and of the umpires. Everything was stacked in Kent’s favour. With the end of the match fast approaching all they needed to do was attack the bowling so that they were well ahead on the Duckworth/Lewis rule whenever the match ended. The loss of a couple of wickets wouldn’t have mattered too much if they could pile up the runs quickly. Instead the two openers Denly and Stevens plodded along at less than six runs an over and with only eight boundaries in the eleven overs they were at the crease before the light became too bad and the umpires called the players off. Unbelievably Kent managed actually to be a couple of runs behind the D/L par score when this happened so despite not having lost any wickets they lost the match! It was tactically inept, spineless batting which defied comprehension. And so this absurd and derisory spectacle came to an end with the home side winning a match that they should have lost and the visitors being denied points by their own ignorance and incompetence. The Sussex administrators, the umpires and many of the players seemed confused by the proceedings which were a parody of competitive sport and about as far removed from the excitement of the Indian Premier League as it is possible to get. And the metaphor? Well nobody took charge, the spectators were kept in the dark (quite literally, some of them), the match descended from one which was dull and unambitious into a farce. All very English you might think in these cheerless old times. Oh Dear!